Matt Illian, father of three and one of our wealth managers as well as authors, has estimated that, for a 2030 freshmen, it will cost on average $161,423 to pay for all expenses of college. With your college savings invested in the market, that means saving $371 per month from the day the prospective student is born. 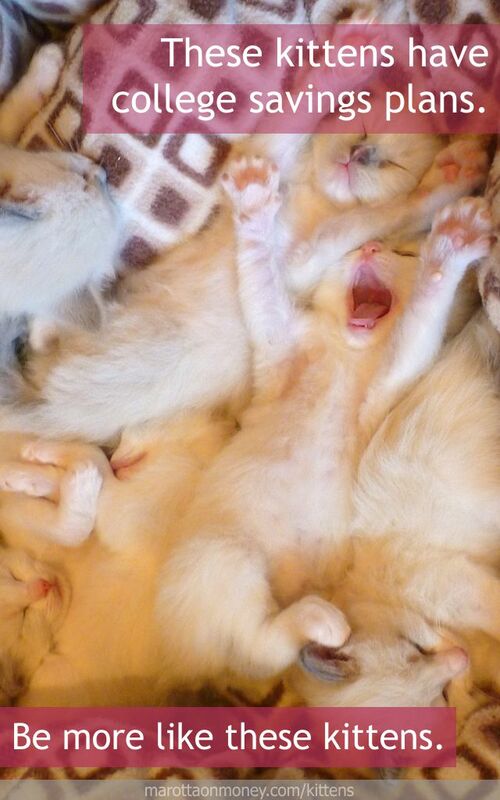 Snow is the mother of a whole litter of kittens. She dreams that each of them will go to college one day, but knows that saving that much money for each of them will be difficult. Although financial aid can sometimes be an excuse to avoid saving money, she knows not to rely on such aid. Per Matt’s advice, she has set up a plan for each kitten, realistically expecting each of them to cover at least 15% of the fees of college with scholarships or savings while she find ways to provide the other 85%. She’s asked the kittens’ grandparents to help contribute to 529 accounts. She also encouraged her kittens to find meaningful work from an early age. That being said, Snow makes sure that she saves for her own retirement before her kittens education. What are you doing to save for college? Photo of Snow’s kittens taken by Steve Jurvetson and used here under Flickr Creative Commons.